Winning domestic trophies has not been a problem for Man City in recent years. On the continent, it's a different story altogether. Manchester City failed woefully in the Champions League last season, despite starting out on fire. After the Citizens cruised through the group stage with five wins, leaving Shakhtar Donetsk, Napoli and Feyenoord all in their wake before thumping Basel 4-0 in the first leg of the last 16, things took an unexpected turn. It began with a 2-1 defeat at home to the Swiss side. A quarter-final meeting with Liverpool put paid to Pep Guardiola’s ambition of adding to his Champions League winners’ medals during Barcelona days. Jurgen Klopp's men were in a ruthless mood. Mohamed Salah and his teammates inspired a comfortable 5-1 aggregate victory over much-fancied Man City. Although City went on to claim a domestic double, it became more or less a consolation. Their hierarchy has made no secret of the desire to do well in Europe. In fact, the two previous managers, Roberto Mancini and Manuel Pellegrini, were both let go despite achieving success in England. Guardiola was considered the man to deliver the big prize. However, after two seasons in charge, the Catalan-born coach has been nowhere near providing the Champions League. That's due to several factors. Firstly, Guardiola has not demonstrated conviction in achieving the goal. Secondly, Man City's inexperience in the competition is a huge stumbling block. Then there's the question of the supporters begrudging UEFA. Regularly booing the tournament's official anthem prior to games at the Etihad is proof of that. Such action creates an atmosphere that is not conducive to success. It led to comments by Guardiola stating the club is not yet ready for Champions League triumph. 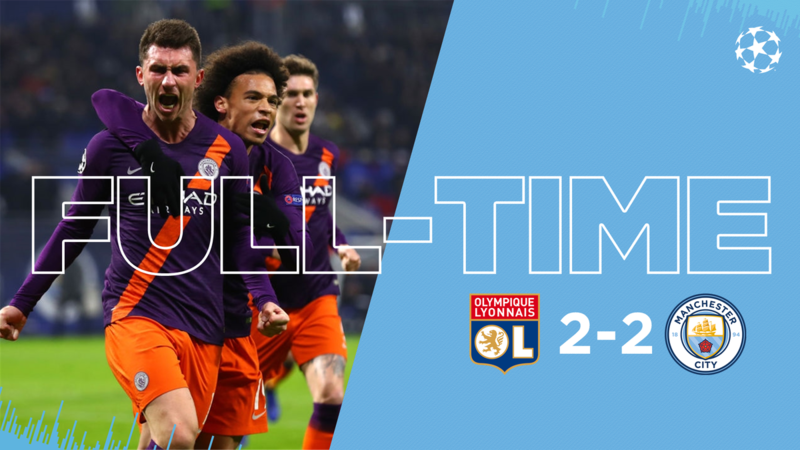 This campaign, City may have run riot against Shakhtar Donetsk, winning 9-0 over two matches, but failure to beat Olympique Lyonnais speaks volumes about Guardiola's side. After losing their opening match 2-1 at home to the French giants, the reigning Premier League champions conceded another two goals to Bruno Genesio’s side on Tuesday night. FULL-TIME | Top game against a top opponent! The draw is enough to see us through to the knock-out stage of the #UCL! Man City qualified for the Champions League last 16 stage courtesy of their recent 2-2 draw. However, the results from the doubleheader against Lyon continued an unwanted trend. Against Europe's more experienced teams, the Citizens have consistently fallen short. In seasons gone, City have been eliminated from the Champions League by Real Madrid, Barcelona and Liverpool, among others. Managers have come and left but the situation has remained unchanged. The defeat to Lyon is the only loss they've suffered so far this campaign. Dominating English football is one thing; achieving European success is another. In fact, sometimes domestic dominance can become a distraction. Real Madrid struggled in La Liga last term as Barcelona ran away with it. Focusing on the Champions League delivered a third consecutive trophy for Zinedine Zidane. The Blaugrana, meanwhile, were booted out at the quarter-final stage by Roma. Man City, therefore, could retain the league title and even secure another double this season, but conquering the continent is improbable while they continue to struggle against top sides. Their best outcome is to reach the semi-finals. Having made the knockout round, the stakes are now getting higher. Beating a not-so-strong side in the last 16 may not be a problem. However, the situation changes from the quarter-finals. At that stage, the boys will have been separated from the men. That is where experience and self-belief become most important. Unfortunately, City are short on both as far as Europe is concerned. Guardiola's motivational skills, as well as tactical ingenuity, are required in order to boost his side's chances. As is the added bonus of Kevin De Bruyne returning from injury. Such things falling into place is the only way Manchester City can make history, lifting the Champions League trophy come May.